When people roll their eyes and scoff at “Bollywood” this is the kind of film it’s nice to have on hand to prove all their misconceptions wrong. 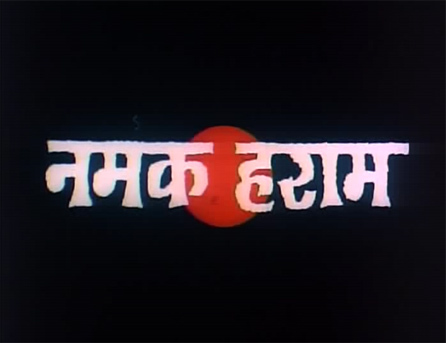 It is a powerful social drama with great performances from everyone and a tightly written (Gulzar) and directed (Hrishikesh Mukherjee) story. There’s not a minute wasted. It’s sad—and you know I hate sad—but it’s a film I’m glad I’ve seen and would heartily recommend, though my swollen eyes may never recover. Wah! Rajesh Khanna and Amitabh Bachchan are paired again as best friends after Anand, and are superb. And Om Shivpuri (who is inextricably linked in my brain to evil Mr. Oberoi in Disco Dancer) delivers in a small but pivotal role as an unscrupulous businessman. The core issue—socialism as a cure for the plight of the middle and lower classes (and a responsibility of the wealthy) still seems as relevant today as it was thirty-five years ago.